I lay on the table in the dark ultrasound room, glowing at the first sight of our squirmy baby. The head, the heart, the kidneys, the tiny hands. It all looked perfect, and the baby even measured bigger than expected, moving my due date forward five days. Shawn and I turned our heads when the ultrasound technician looked for the gender, and when I asked her if she could tell, she said, "Oh, I can definitely tell." We peeked at each other and smiled. As she was finishing up her measurements, the ultrasound technician seemed to be very intent on getting a clear picture of the left foot. The legs both looked great, but she couldn't tell if the left foot seemed turned in a little. At first, it didn't worry us at all. But as the clock ticked on and she had me change positions a few times to get a better look, fear began to creep in. She left the room at the end of the ultrasound to meet with the radiologist and discuss her concerns. Thankfully, the radiologist didn't feel the need to come in and look any further, but said it did look like the left foot was turned slightly. At the same time, it could be nothing. It could be as bad as a clubfoot (which is actually a very common, treatable condition), and as little as an odd position in utero where baby's foot just got comfortable against the placenta. After walking out of the office, Shawn headed to work and I drove home, feeling somewhat deflated. This moment I had dreamed of hadn't gone as planned, and no new parents want to hear that there's something concerning about their baby. When I got home to my quiet house, I sat on the couch for a while staring at the ultrasound pictures and allowing my heart to wander into dark territories of fear, distrust, pity, and guilt. What if this turned left foot was the sign of something bigger, like Down's or spina bifida? What if he's never able to play soccer like his daddy? What if it's because I'm a small girl growing a big baby and he's cramped? What if's are deadly, as if I hadn't learned that by now. I had to prepare for lots of out of town company coming in to celebrate our gender party that afternoon and evening, and I felt so guilty for not being excited. I was trying, and I was thrilled to find out we were having a boy, but all I could see was that turned left foot. Shawn and I both prayed for peace - and our family prayed for us as well - that Satan would not be allowed to rob us of the joy of our son. And the Lord was faithful to give it. The fear still came in waves for me, but I was determined to enjoy the beauty of so many family and friends gathered to celebrate this new life. 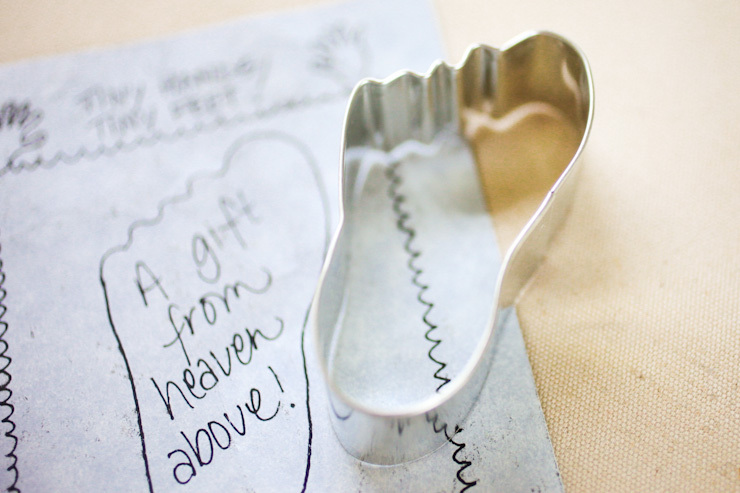 A cookie cutter in the shape of a tiny left foot. And the words on the paper below... "A gift from heaven above." I can't even type those words without tears in my eyes. I thanked her for the gift and as she didn't know anything about our baby's left foot (only a few people did), she had no idea of its significance. I felt so loved by Jesus in that moment. I'd been dwelling all day long on a tiny, turned left foot, and He shows up through a cookie cutter to remind me that He knows. He cares. He has purpose and displays glory in all of His creation, even if it doesn't look so glorious to us. I know that we're going to be ok, no matter what the outcome. I type those words with full confidence because I feel peace in a way that doesn't make sense apart from Him. Last night was such a reminder to me that not only is our son so loved by his grandparents, his mom and dad, and a thousand friends who would do anything for him... our son is loved by Jesus. What more could we ever ask for? I know that so many of you who read this are prayer warriors. As you think of us, I humbly ask you to please pray that the Lord would continue to guard our hearts and protect us from worrying about the unknowns. And pray for a miracle... that at my followup scan, they wouldn't be able to find what they'd seen before, and the foot would straighten out. We will deal with what comes by the grace of God because He loves us. We know that full well. wow - what an amazing story! of course, you all will be in my prayers. God is so faithful and will continue to be so. love you! Thanks, friend. Love you so much. This brought tears to my eyes. God is so good in His all-encompassing love! I love that He used another one of His little children to bring you peace and a reminder. I hope He surrounds you and Shawn with a peace that surpasses all others' understanding. Our God has big plans for your little boy! He will be a light to many. It will be wonderful to see how his sweet little life enfolds. I hadn't even thought of that verse, but it ministered to me so much. Thanks, sweet Bethany. Thank you for sharing this! The Lord is so good to remind us of how much He loves us and cares for us in the most wonderful ways. Your baby is definitely a gift from heaven in which you will be truly blessed. My prayers are with you. Wow! You couldn't have got a clearer message! I am picturing a darling 5 year old boy ... making cookies with his momma ... left foot cookies ... while a sweet story is told. God is just so ridiculously cool. That thought brought tears to my eyes. And yes... God is just amazing. That's all so good to know. Thank you! Wow, that story gave me chills... God is AMAZING! He always seems to give us blessings (whether big and small) in times of great need. Got so teary over that gift. We will continue praying for you guys & trusting that God will grant you the peace & comfort you need to make it through each & every moment! Love you my dear friend! So appreciate your prayers, friend. Love you. Oh my... God is so amazing in his love for us. Praying for you and that you rest in the joy and beauty of all that is given to you and that no fear and worries steal the joy that is in these moments. What a tender mercy from such a sweet small child. God knows exactly who to send to us and what moment. Congrats on the baby boy! What a wonderful and reassuring gift from our incredible and all knowing Creator of life. Even in distress, the Lord has already brought this situation to His glory! So exciting!! Our boy measured in the 95th percentile which means... huge. :) Not exactly surprising considering Shawn is almost 6'5", but still... I've got a lot of growing left to do. Excited for Thursday for you! This is incredible. I love God stories. He makes my jaw just drop sometimes. I love it! If's are deadly- I speak from recent experience. I needed to read this post today- thanks so much for sharing with all of us! The three of you will most certainly be in my prayers in these coming Months. So thankful for a God who is bigger than this!! I read your blog all the time, but I've never left a comment. I was so touched by God's grace in this post. I was born with a club foot (my right foot), but it was corrected at birth and God has blessed me with a full life in which I forget that I even had one. What a sweet story. I too, had tears in my eyes. Our God is big and our God is good. And he promises to take care of those details in his way and time. My cousin and his wife are experiencing similar things. Just today, at 6 weeks early, they are inducing her because of pre-eclampsia. They are having a little girl whose intestines are growing outside of her body. Do first time parents ever think this can happen to them? Absolutely not--but they are overwhelmed with peace that can only come from the Lord. If you remember, pray for Terry and Debi. Once she is born, they will wait a day, and then surgeons will work on her little body and she'll be in the hospital for a few weeks--they have a long road ahead, but are so ready to love their little girl with their whole being! I'll be praying for you guys--thanks for sharing! This is so beautiful and encouraging. As a mom, the "what if's" come way too easily. There is ALWAYS something to worry about, and there always will be. What a huge, wonderful God we have, who reminds us not only that He knows all of our little worries but that we don't need to worry at all, no matter what, because He's got it all figured out. Is baby a boy or a girl?